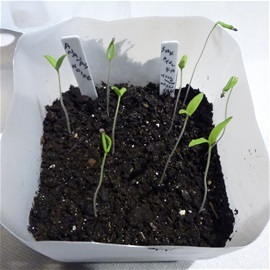 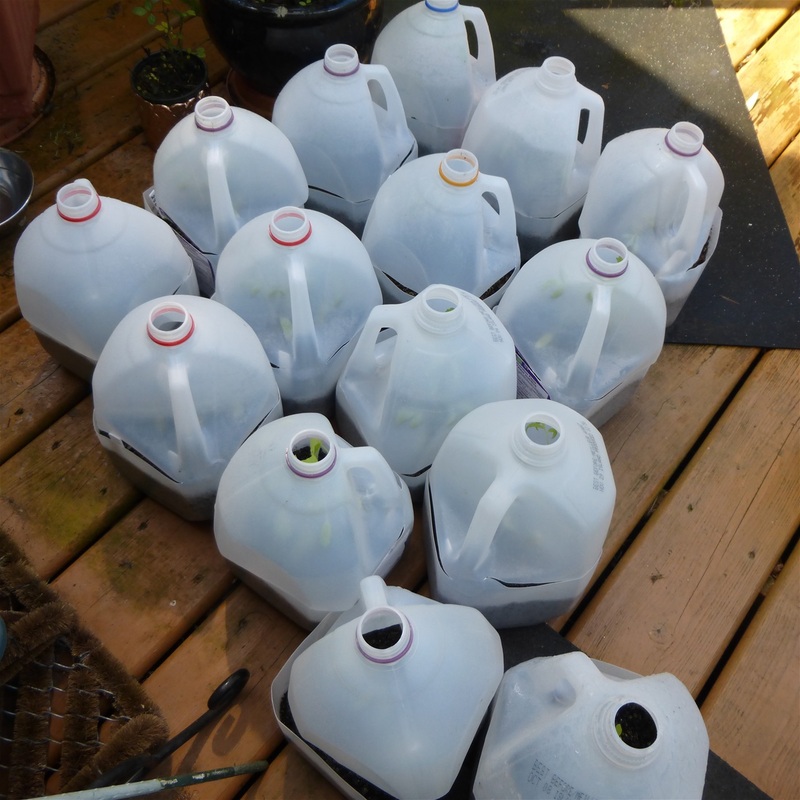 February 26, 2018 showing 38 varieties of Heirloom Tomatoes being germinated for summer crop. 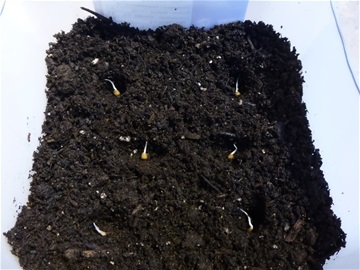 Here they are sprouting further the next day, about day 5. 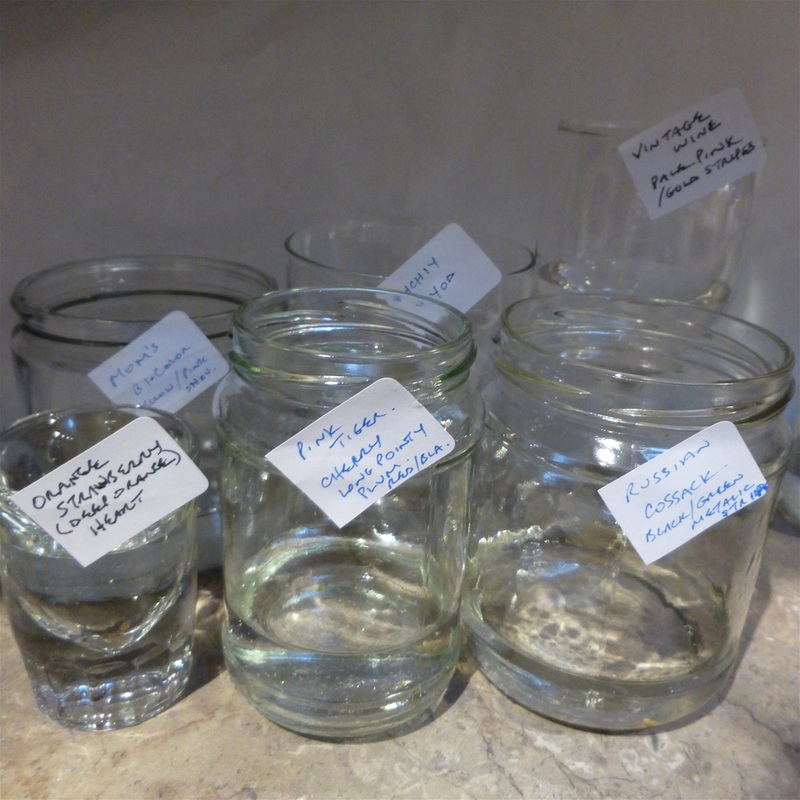 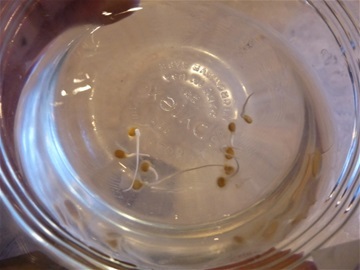 Keep in mind not all seeds sprout at same time in your jar. 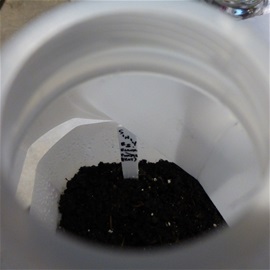 Ideal length of germinated seed for placing in soil, however sometimes not all the seed is sprouting as fast as some. 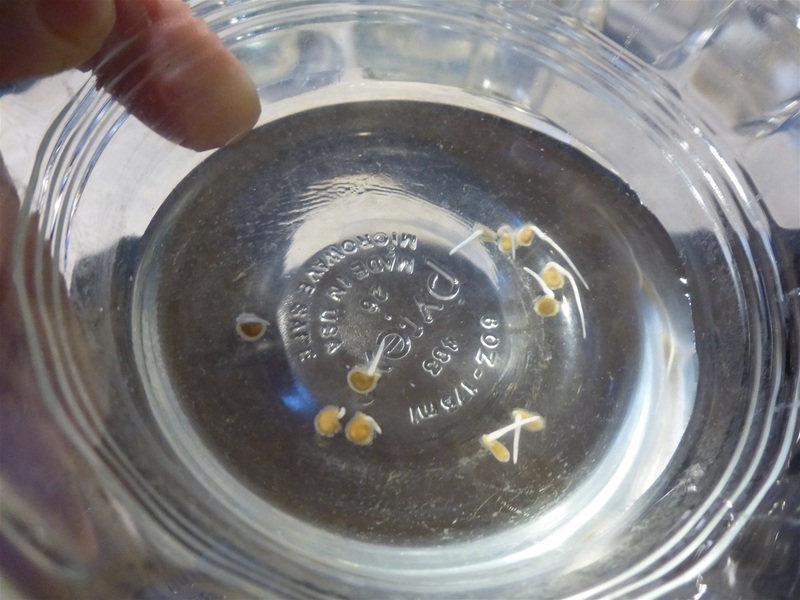 You may have to wait a few more days for slower germinated seeds to catch up to the longer ones. 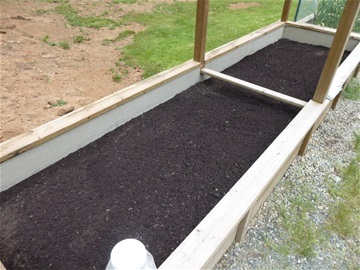 Means you have to plant the longer ones deeper to cover them. 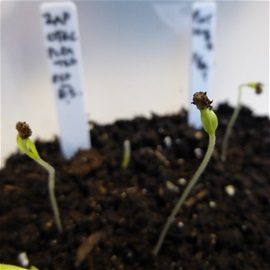 Here are some longer germinated seeds showing. 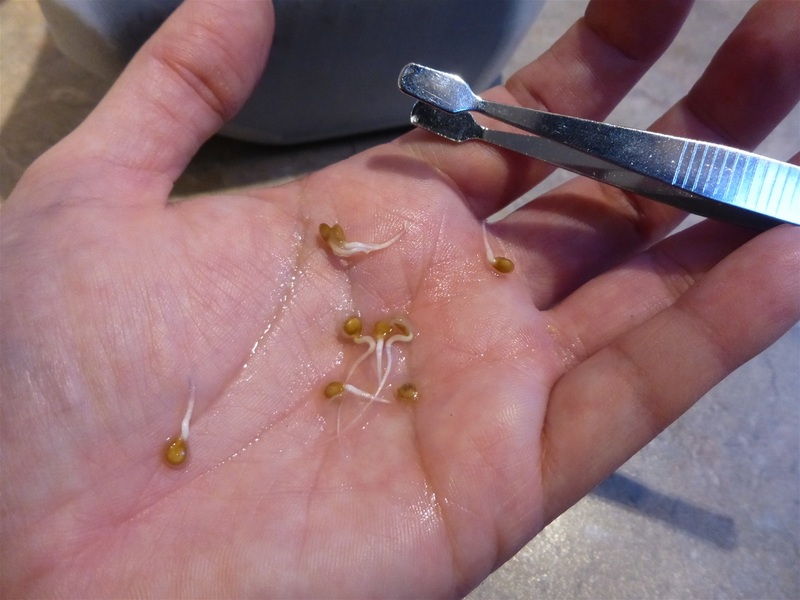 Showing you the "Flat-headed Tweezers" I use for easy handling of sprouts. 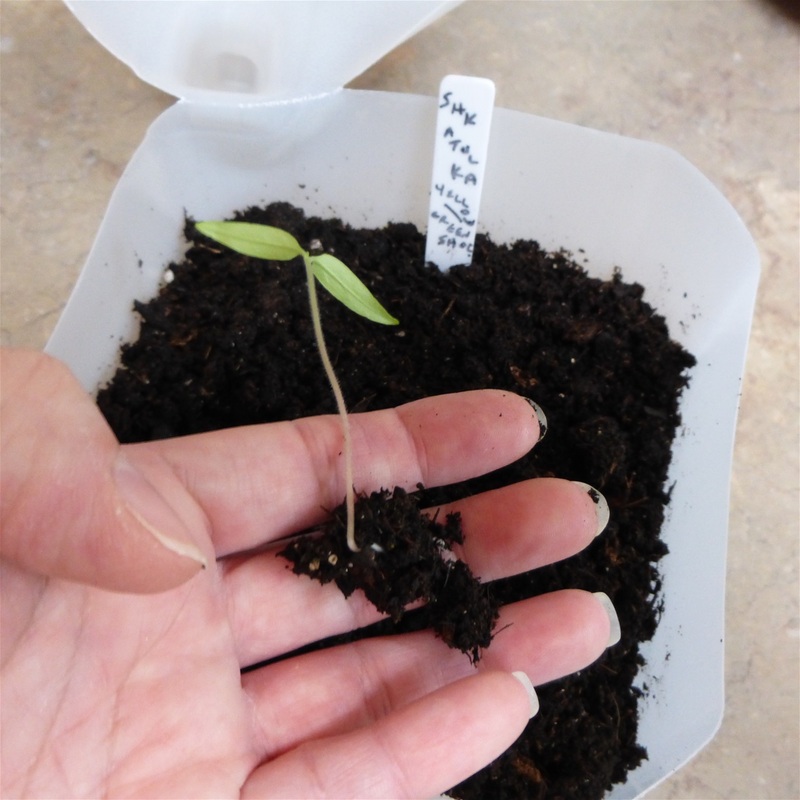 Perfect sized uniformed sprouts for planting. 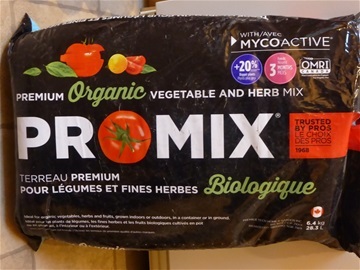 My favorite soil mix to this day... in 20 years of experimenting. 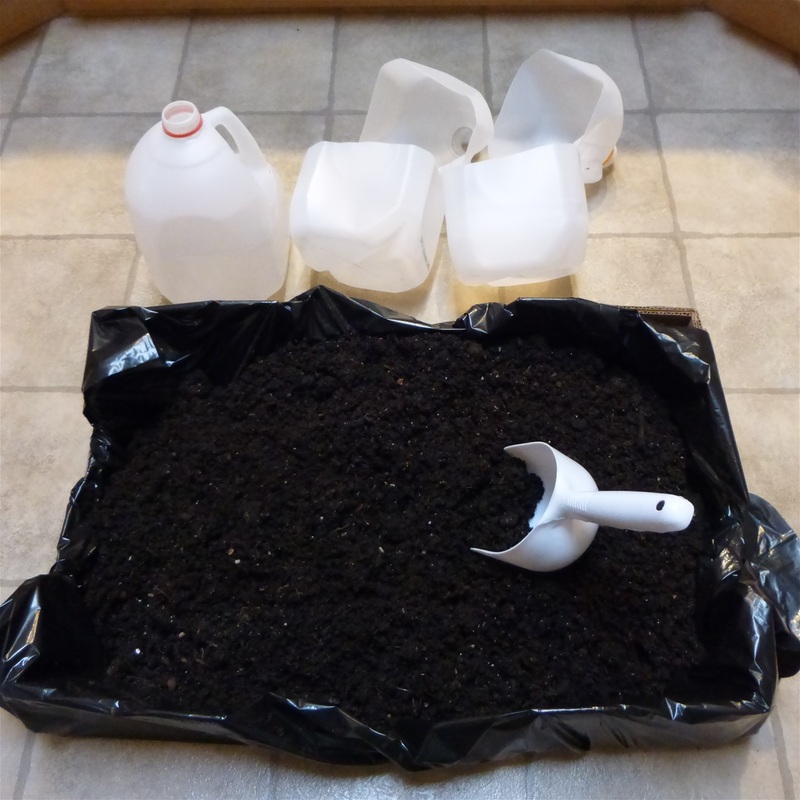 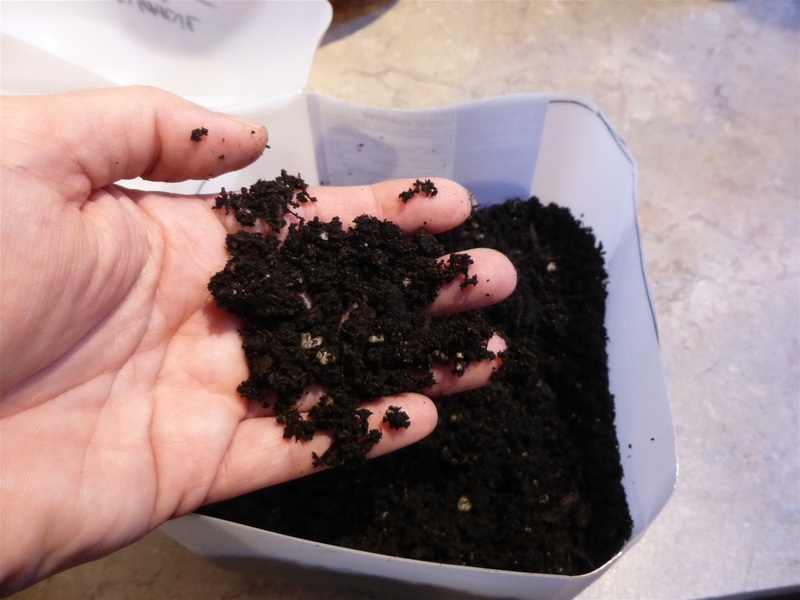 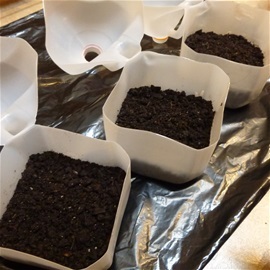 Easy no mess... Costco box put into a garbage bag and then pour soil in it... then add water if soil is too dry. 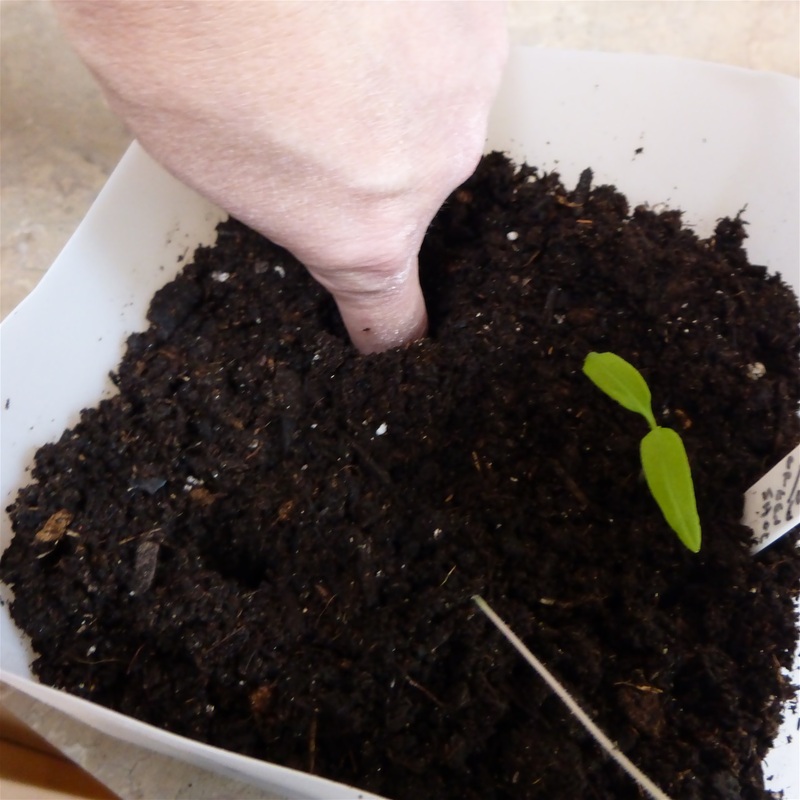 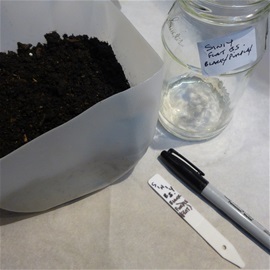 Go through soil to pick out any big pieces that can get in way of sprouts. Everything ready to plant... 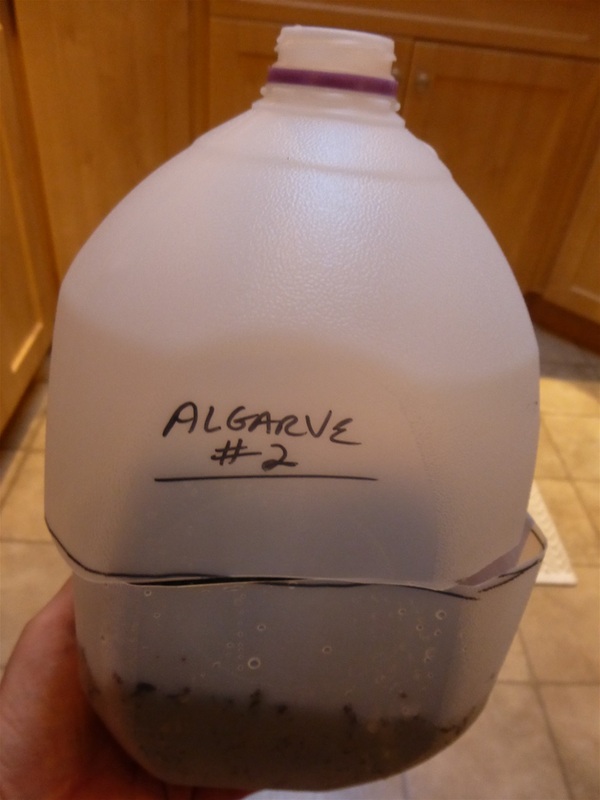 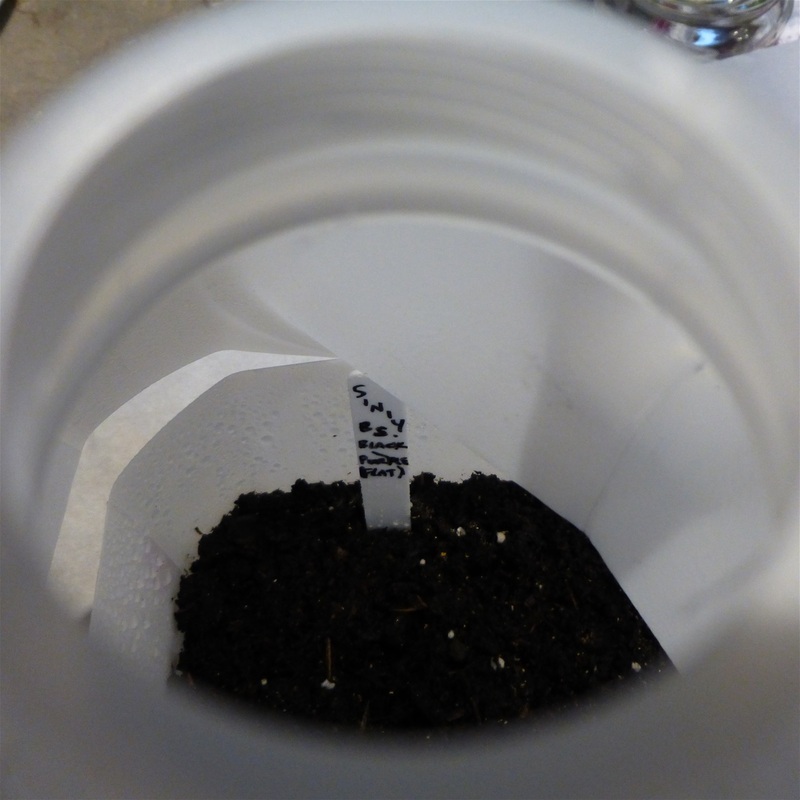 I now use a "Garden Marker" instead of a Sharpie and actually label the outside of the jug with the tomato variety name instead of using stick labels... makes life so much easier. 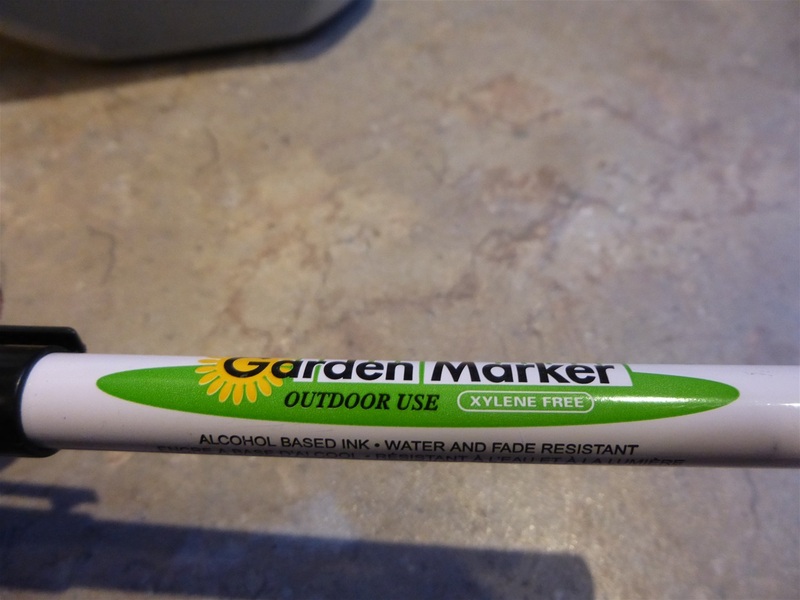 You need a "Garden Marker" for outdoor UV protection to be able to keep reading your label. UV will eat the ink off from a "Sharpie" and after a few months, you won't be able to read your labels. 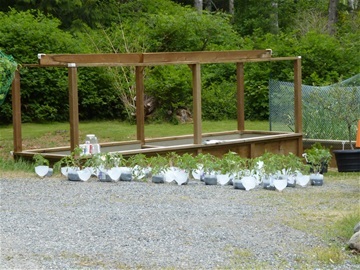 Get at specialized garden centers. 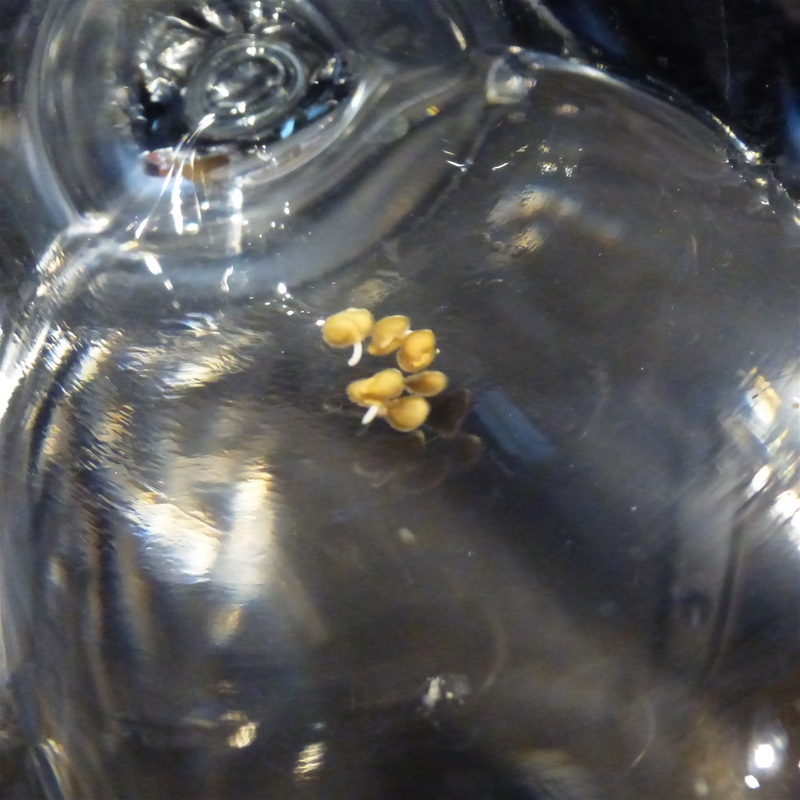 Placed sprouted seeds in holes deep enough to cover. 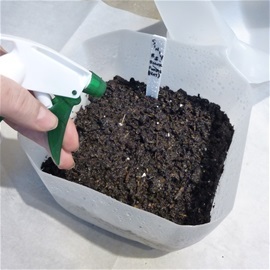 I then spray the soil lightly after I cover the seeds to ensure the top has enough moisture as this top layer will dry faster then the rest. 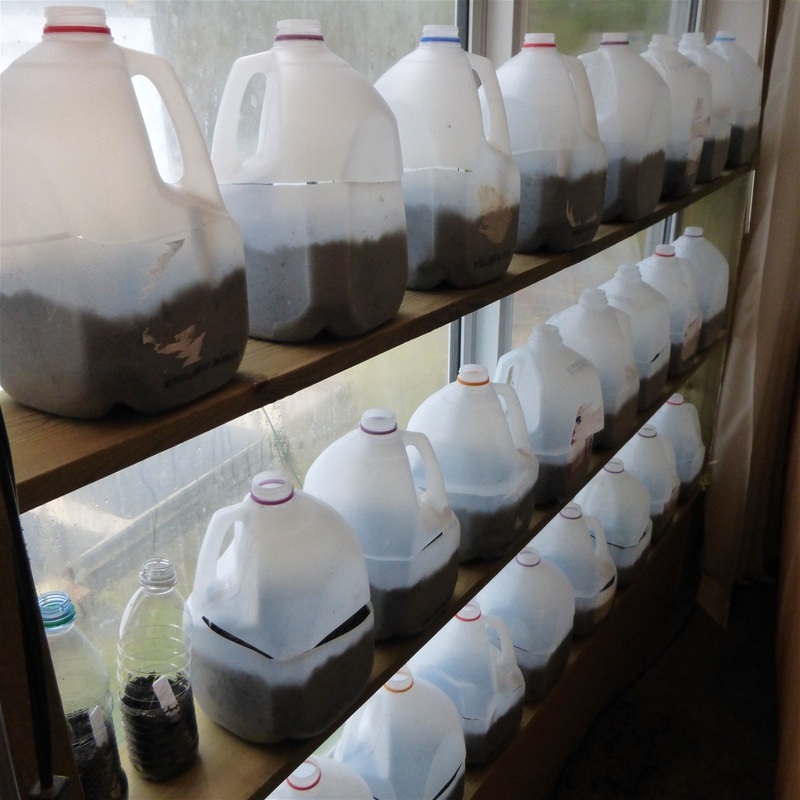 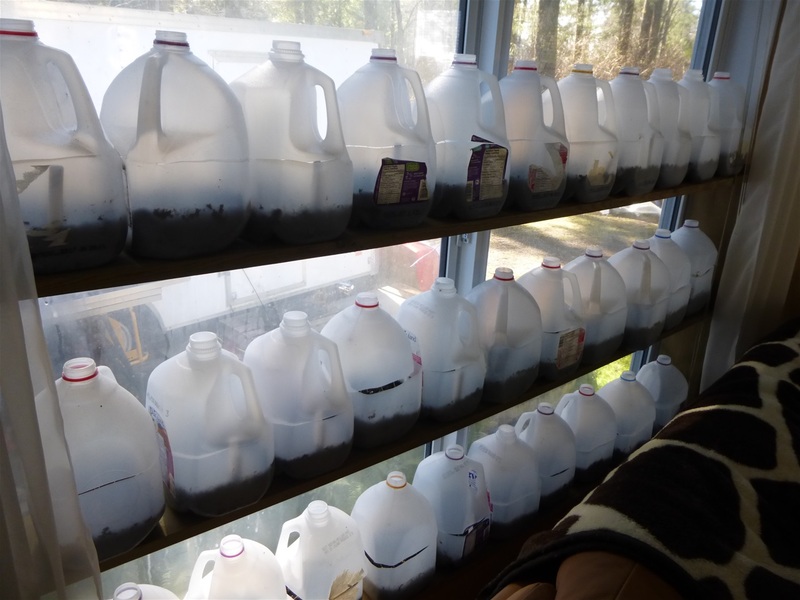 Notice half of bottom of jug with soil only for germinated seed planting. 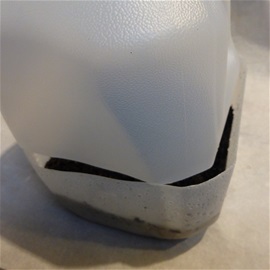 As you can see, I want the top to be slightly askew so that the air will flow through the middle as well as through the top. 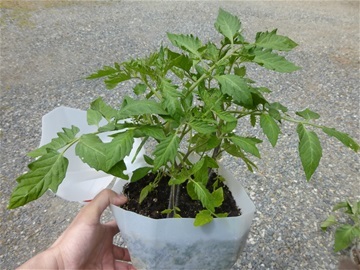 Keep cover cap off for circulation of air... It will take another 2 or 3 days to come out of the soil. 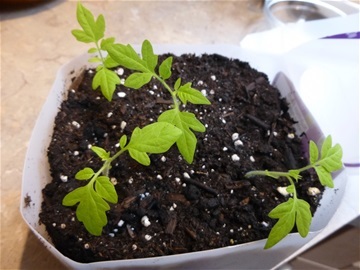 They sprout fast, and once they are about an inch and a half, put them on the window sill, south facing. Here it shows them coming out of the soil on Day 2. 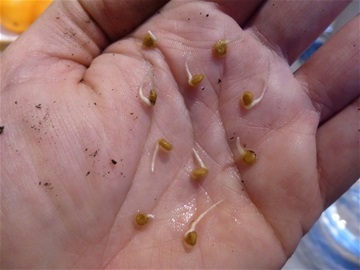 Seedlings about 8 days of sprouting, ready to re-transplant for 2nd time. Select your best 3 seedlings for transplanting. Here you will notice, half way down the stems turning a slight pinky-purple hue and already thickening at this stage... this is a good time to re-transplant for the stems to be almost totally covered. 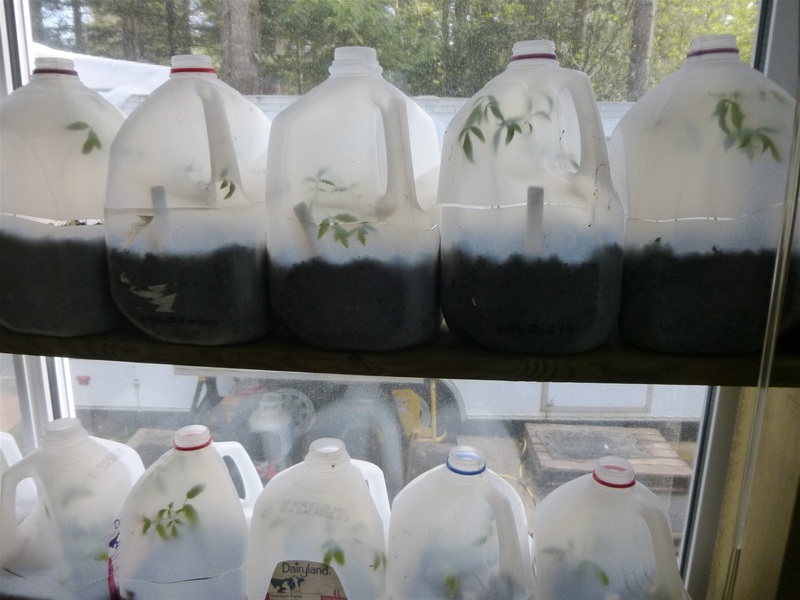 I plant the best 3 seedlings of each variety in each milk gallon for lots of growing room from the 6 seeds I germinated. Made hole full length of the seedling with my finger, leaving about a half inch stick out, then lightly dropped them in. A delicately light press around base and done. 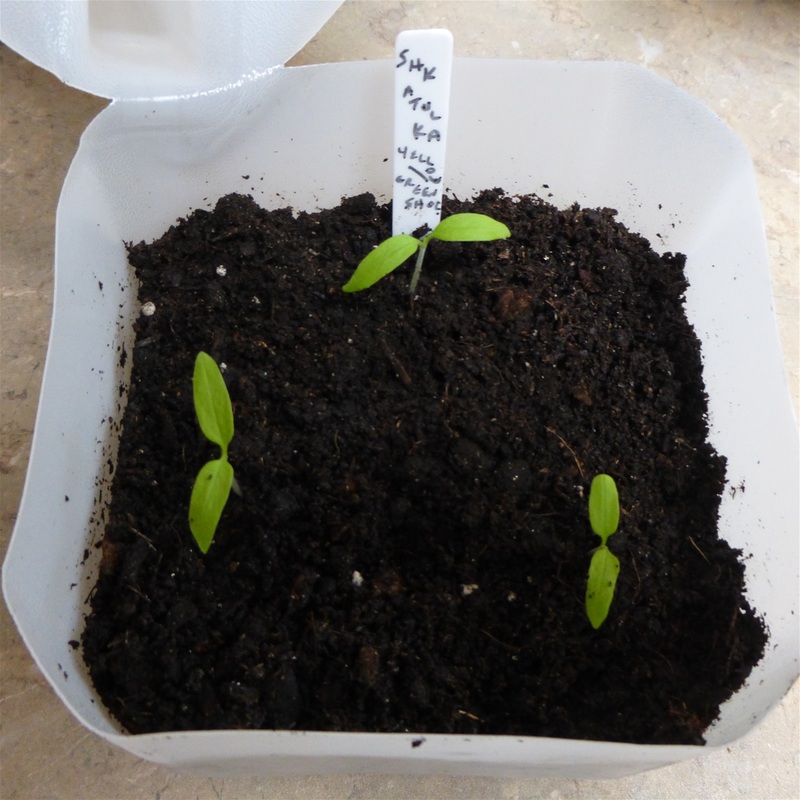 Here we have the 3 seedlings as you can see, with most of the stem buried. 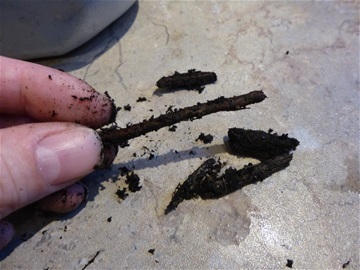 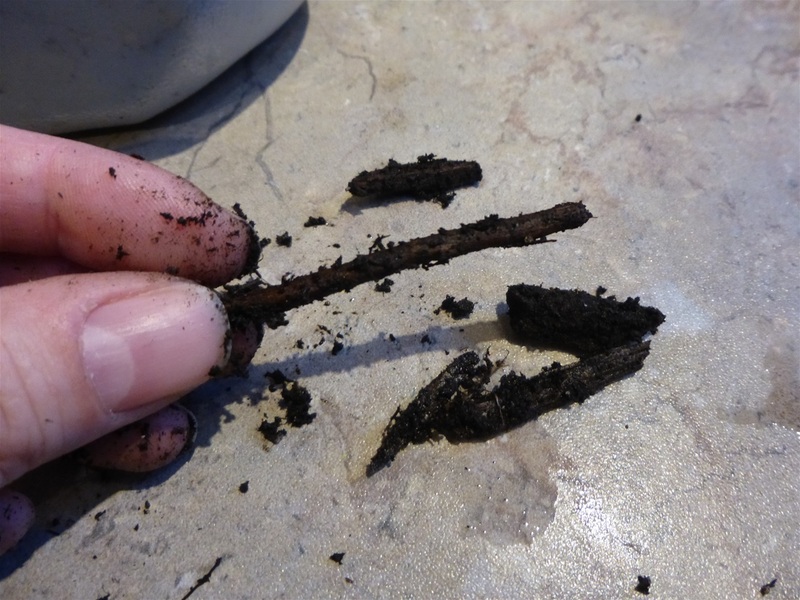 Need to bury the stem like this or you will have the chance of them dampening off (rotting and dying basically). 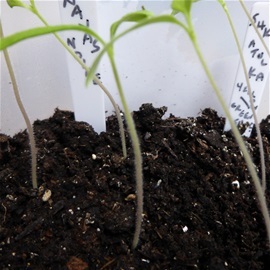 Otherwise, the seedlings will keep stretching and you don't want that to happen. 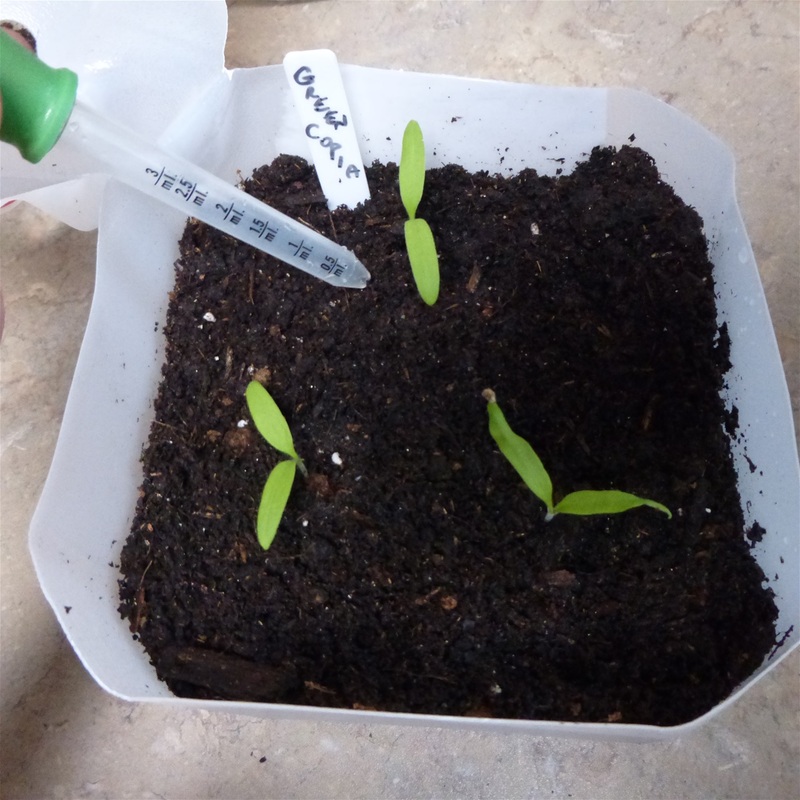 I use a wide pump syringe to give them water at their base after transplanting, using previously boiled water that has been cooled. Here they are re-planted, watered and ready to fold over the hinged top again. 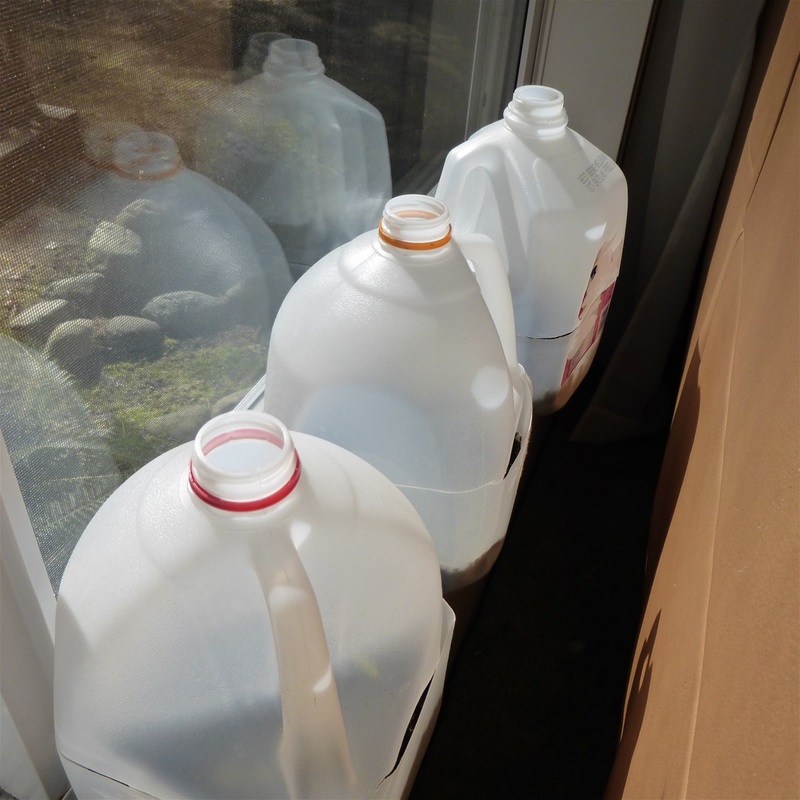 Remember to leave the top askew as to keep air flow and place back on the window sill turning the gallon a 180 degree turn ever 2 days. 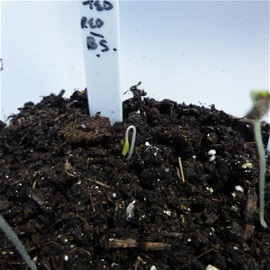 This is 7 days after transplanting the seedlings deeper. 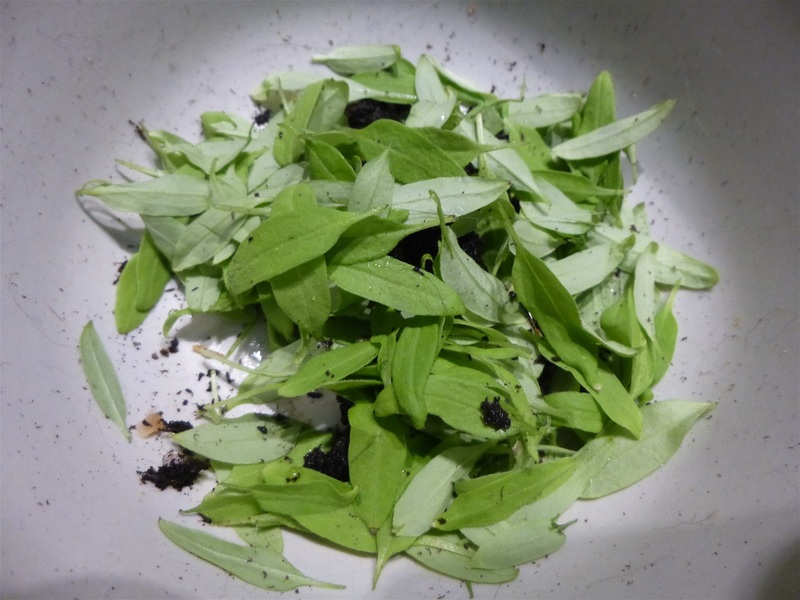 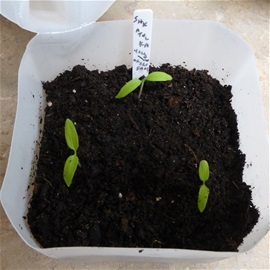 You can now see the second leaves and the seedlings have now grown to about 4 times their size. 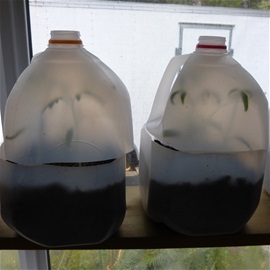 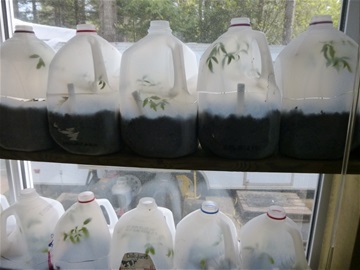 The "Heiloom" tomatoes growing in their milk jugs... you can see how effective this little greenhouse is and really promotes their growth. 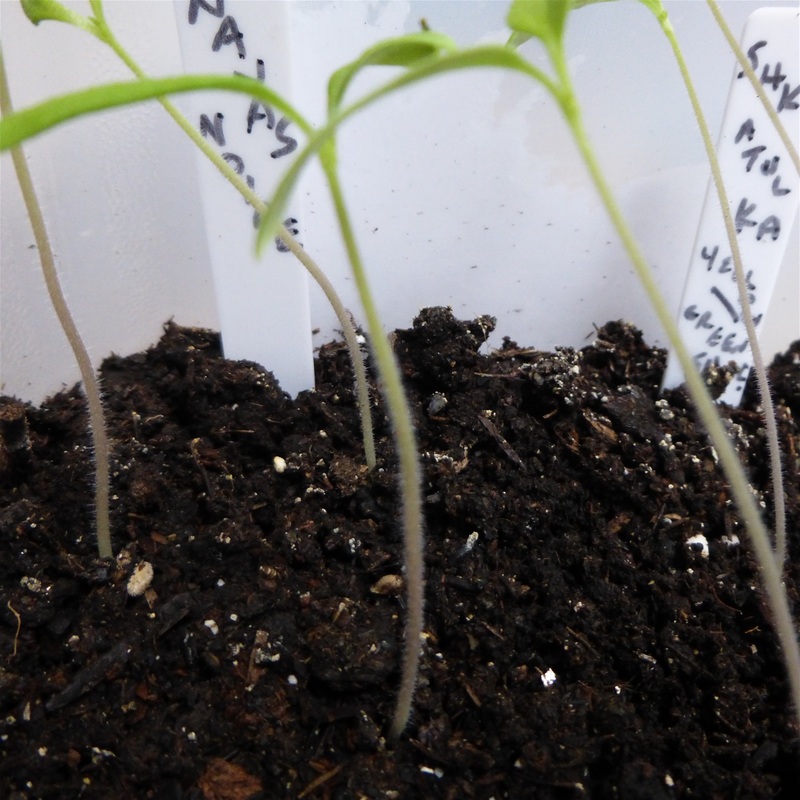 Will be hardening them off soon in a few days. 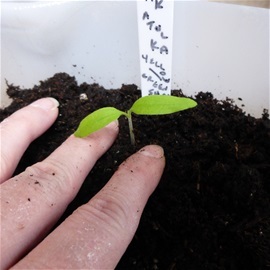 Must pinch off "Cotyledon" (first set of leaves) at this stage. 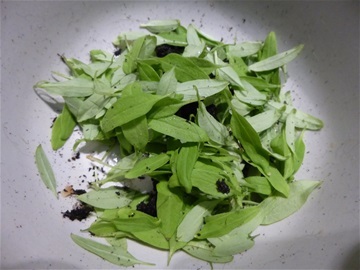 Pinch first leaves close to main stem. Seedlings after pinching off first leaves. 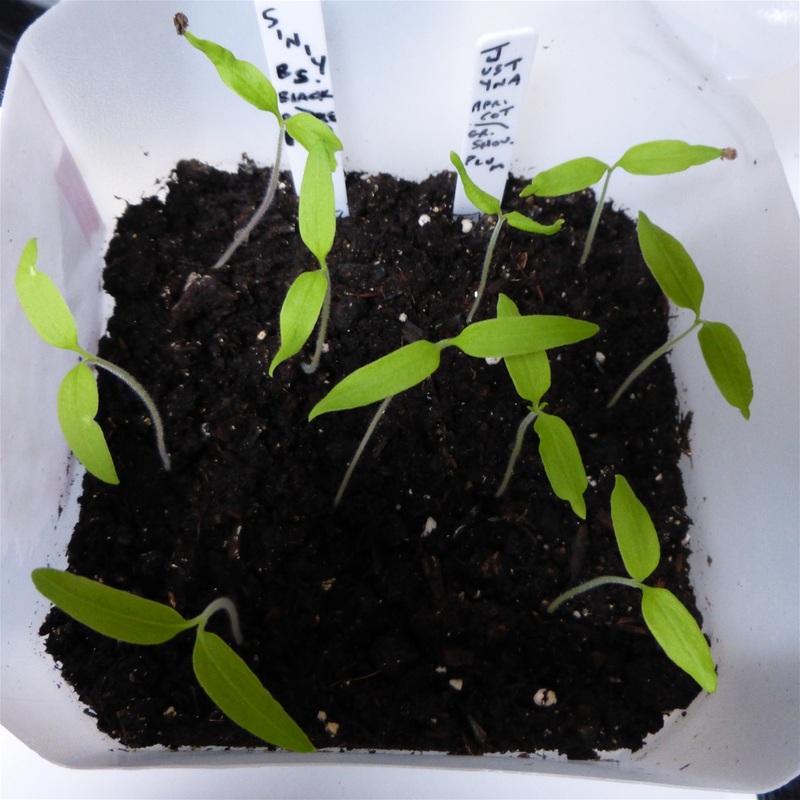 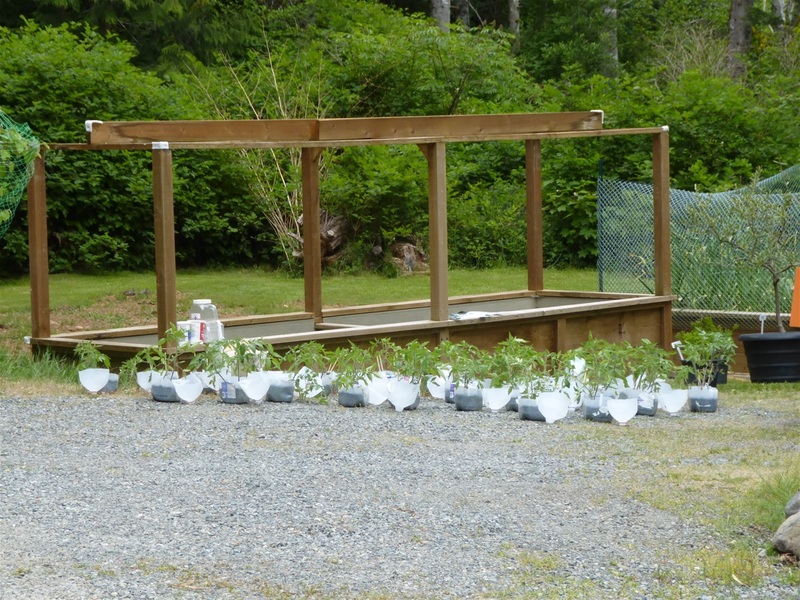 Early March (2018) showing 38 varieties of Heirloom Tomato seedlings in our window. 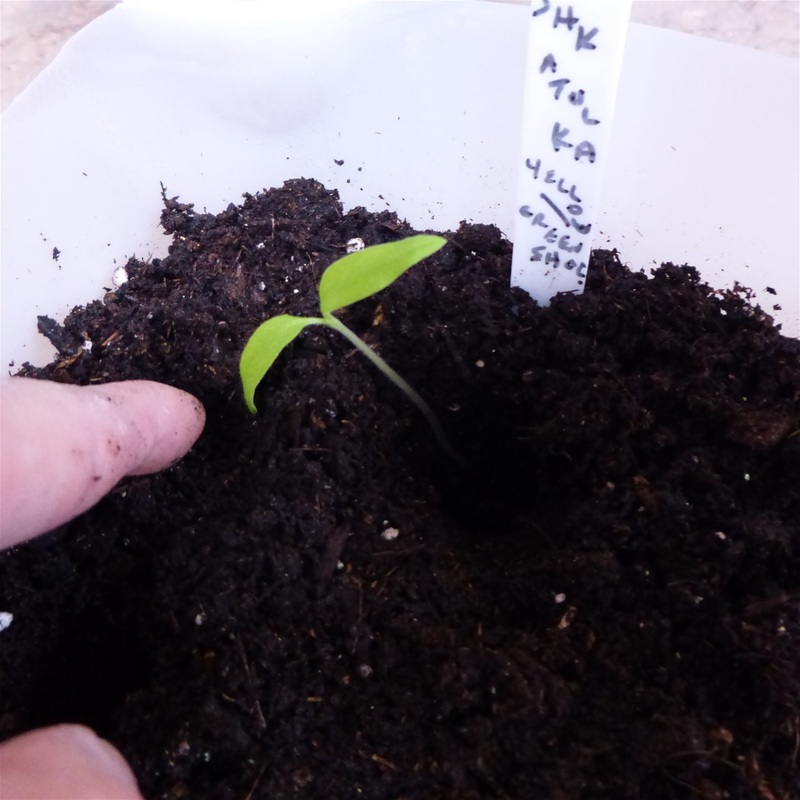 A few weeks later, you can see the growth spurt. On the last week of April... "Hardening Off" Heiloom Tomatoes. Tomatoes up above on a shelf in a greenhouse from May to June to continue growing once hardened. 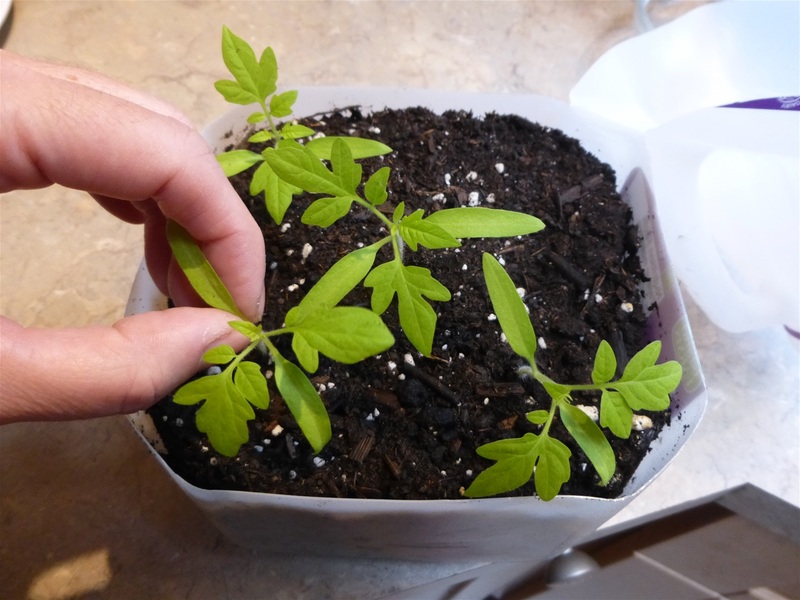 Tomato seedling ready to plant. 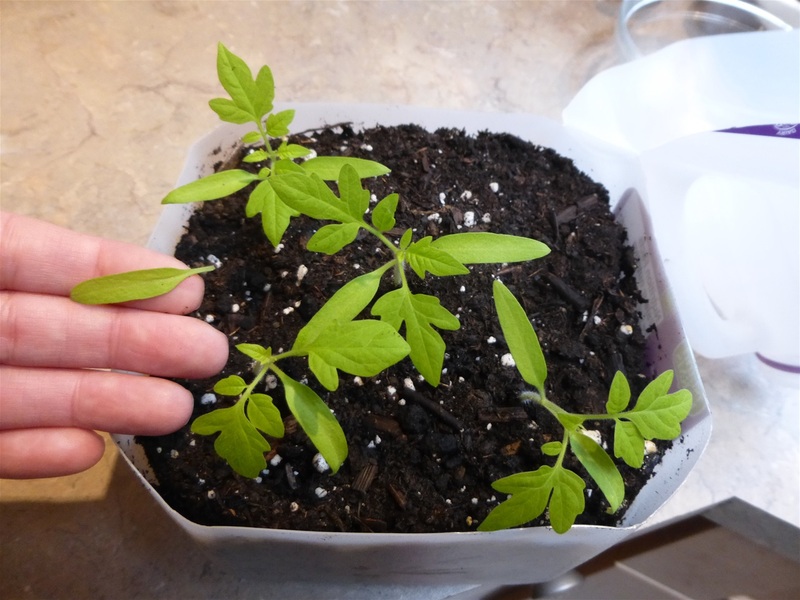 Another variety of tomato to plant... they all grow differently. 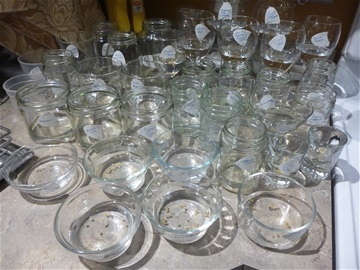 Selecting from 80 seedlings to plant. Showing prepped amended soil ready to plant. 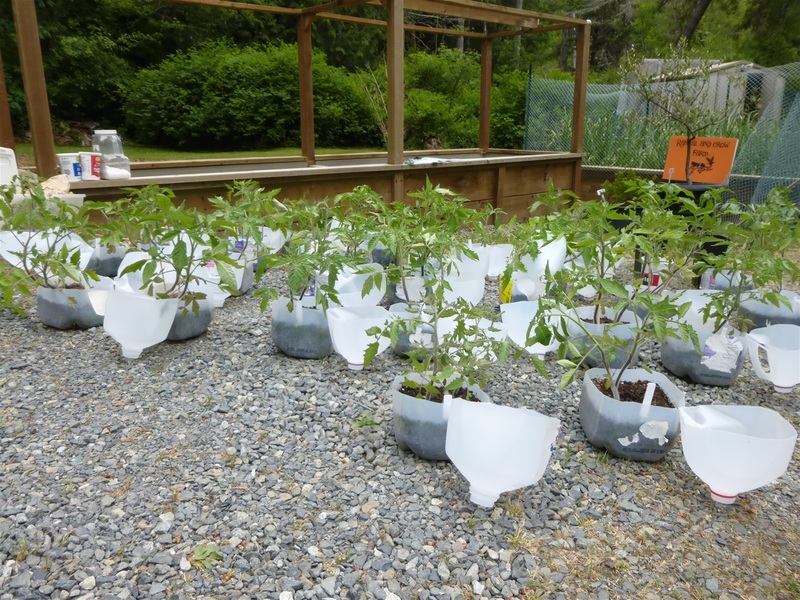 Here we share, after many years of research and experimentation, the easiest and most sucessful way of growing "Heirloom Tomatoes" on our farm. The tomatoes grown by our method, proved time and time again to be the best, least problematic and stongest in seedling growth to maturity. 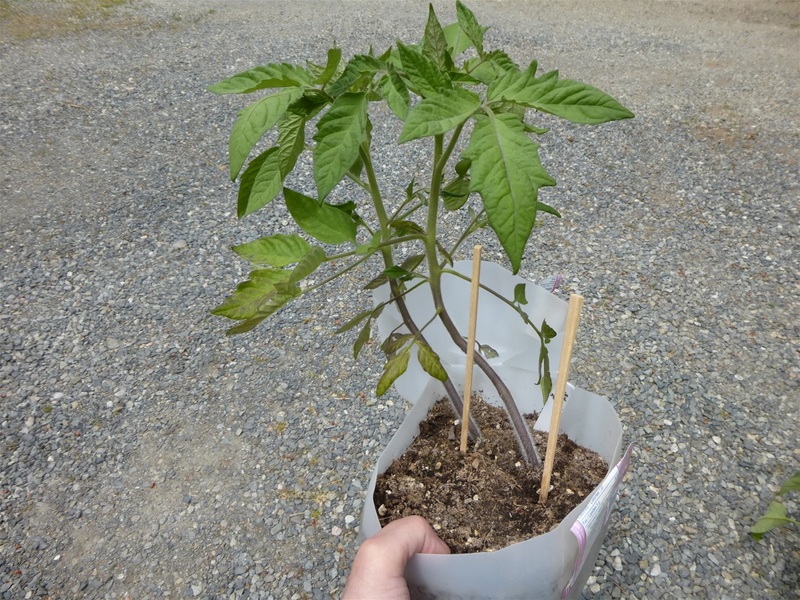 A good balance in soil and the right environmental conditions will yield great crops. 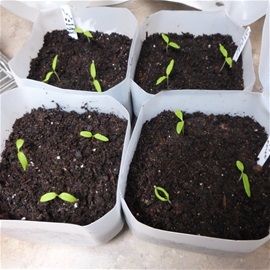 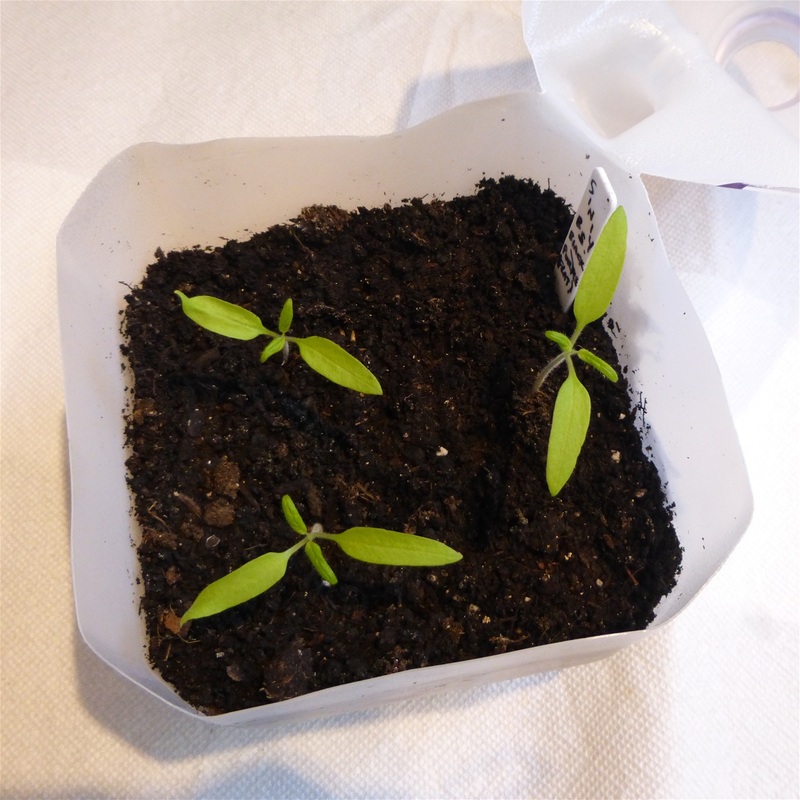 We will gradually add to our album, step by step pictures in the stages of growth until we finally plant the tomato in our greenhouses. We hope this will help with your next gardening adventure. 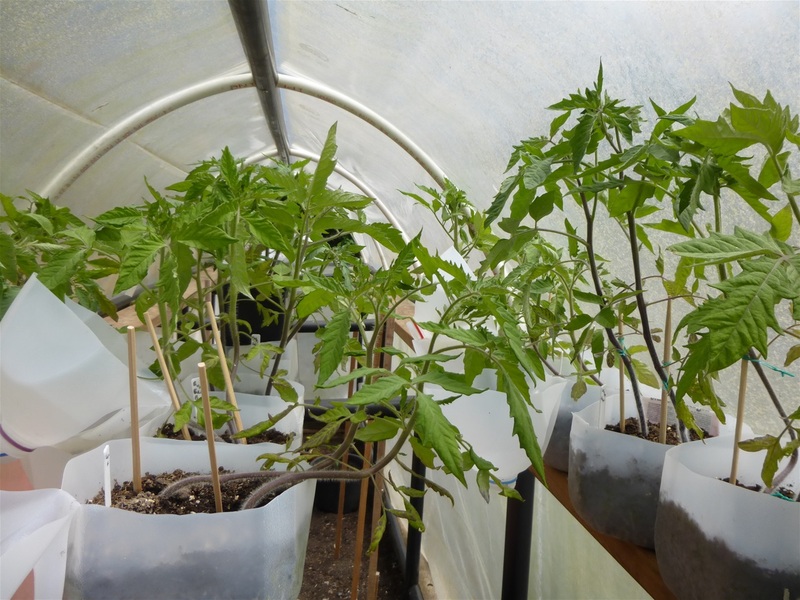 Visit our "About Us/Info." in the categories above for more information on what other variables affect tomato crop outcome.